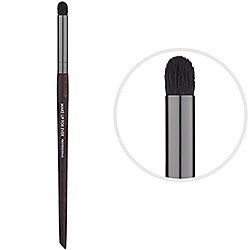 This smudge brush from Makeup Forever is perfect for blending eyeliner on the top and bottom, and adding intensity to the outer corner. If you are only going to buy/use one brush it should be this, especially if you are a smokey eye aficionado. I use it in the AM to lightly blend out my brown eyeliner (I skip shadow) and at night I will use it to smudge black liner thus creating the most imperfectly perfect eye. What are you using this season?